…I’d forgotten that I even had it, until I came across it while reorganizing some comics at home. I tried glancing through it right now, and boy, I think I’ll need to wait ’til I’m more awake than I am because I just can’t just process the information this comic is throwing at me. I mean, I can barely run the gauntlet that is this book’s cover, there’s so much going on there. 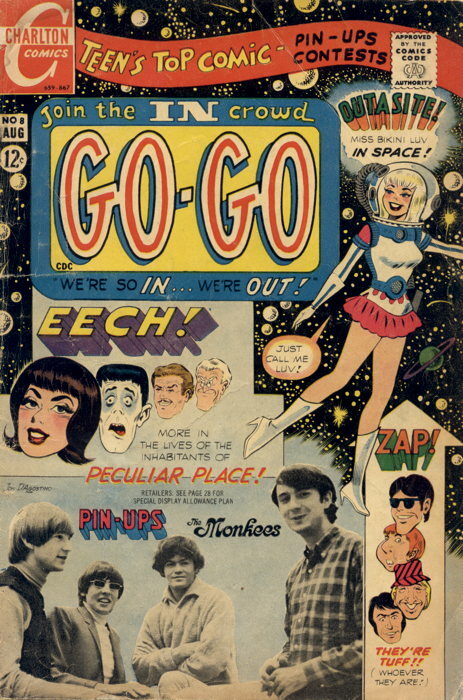 The stories do give the appearance of trying really hard to achieve that crazy anything-goes wackiness that all you late 1960s nutty teens were into. …drawn by Jim Aparo, of all people, sorta/kinda circling around a vague Wally Wood-esque style. Since opening my shop, aside from the few new comics I pick up every week, I’ve kept precious little for myself from any collections that have entered the store. In fact, it has primarily gone in the other direction, the vast Mikester Comic Archives having been about 1/2 to 2/3rds sacrificed to the store’s back issue bins. But there have been one or two things that have made it back to my house, such as finally putting this in the ol’ swamp monster collection. And there was this comic (speaking of 1960s comics trying awfully hard to be funny) which nicely filled a hole in a run. I should have asked this during your Q & A a few months back, but exactly how vast is/was the vast Mikester Comic Archives? Anywhere close to WorldRecord-Man (the fellow in Mission Viejo Guinness recently named), or closer to “just vast enough to supply the better part of a newly-opened shop”? Man, would I love a full-sized poster of that cover. There are not enough companies getting licenses to just make frameable covers of old comics. I think I have an issue of this kicking around somewhere. Weird, but fun. Does this issue have a Blooperman story in it? I’ve heard those are kind of fun. So I have been following your site for a while and yes, whenever I see older appearances of Swamp Thing I wonder if you know about them. I started my copy of the latest Showcase Presents Legion of Super-Heroes Vol 5 today and in the reprint of Superboy #198 Clark and Lana are about to enter a “Horrow Haven” tent and on either side of the entrance is Man-Thing and Swamp Thing. If you do well good and if you didn’t, well you are off on a quest, right? I dig the Aparo art. This is pretty much the perfect kind of space age sci-fi retro wackiness for a Valentine’s Day gift. Thanks! I never guessed that was his work by looking at it!